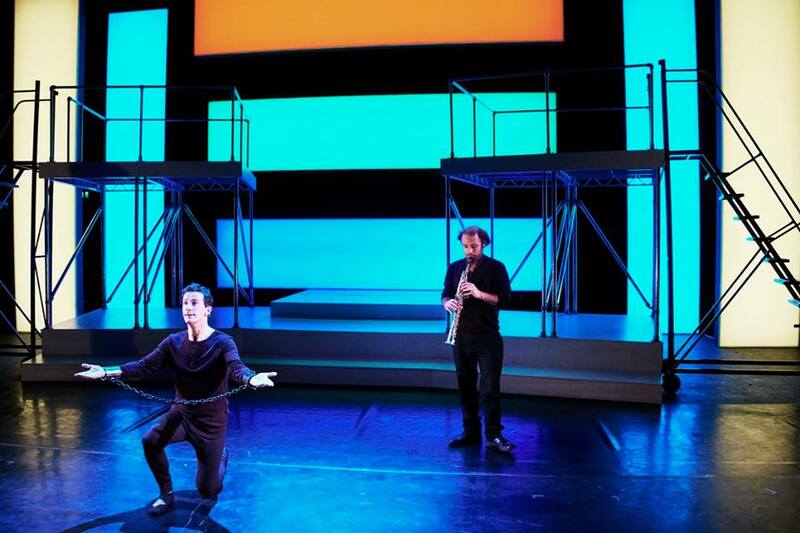 Where do you start to describe Heresy, “Ireland’s first electronic opera” by composer Roger Doyle? You can’t, and I won’t. Besides, there is no point. It’s not about the story. It’s not about the singing. To some extent, it’s not even about the music. Heresy is, from start to finish, an exquisitely conceptual and sophisticated piece of metatheatre in disguise of an opera. 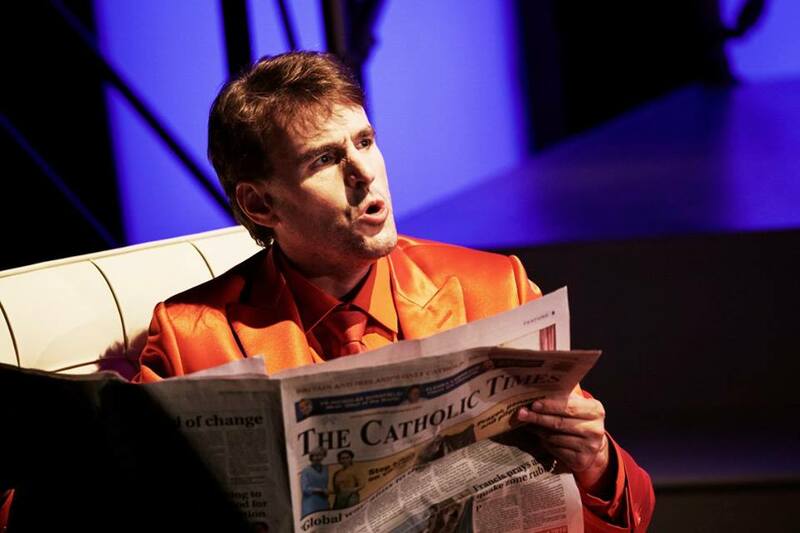 Roger Doyle’s opera tells the story of the 16th century heretic Giordano Bruno, burned at the stake in 1600 for believing in the Copernican heliocentrism and a number of other revolutionary ideas. He was one of those fascinatingly eclectic figures of the Renaissance, who doesn’t stop wielding his influence over the centuries. Ever a symbol of free thinking, among others, he captivated the imagination of James Joyce, who referred to him several times in his Finnegan’s Wake. In turn, Doyle’s fascination with Joyce’s work spurred his interest in Giordano Bruno, and that’s how Heresy was born. Heresy is here clearly a meta-title: the ‘heresy’ of the title refers as much to the protagonist Giordano Bruno as to the ‘heretics’ Roger Doyle and director Eric Fraad, and to the idea that opera can be anything different from the classical canon set by the great opera composers of the past. “Electronic opera” will in fact be read by many as an ‘heretical’ oxymoron; as heretical may seem the almost total lack of a live score (no orchestra! ); while the musical, visual and dramatic lack of unity together with the multiplicity and juxtaposition of musical styles are all a very fitting artistic match for the multiple universes theorised by Bruno. This provocation immediately prompts the question: what is opera? Or, more precisely, what is the essence of opera? Is opera synonymous with classical music? Does opera exhaust itself in bel canto? Or is opera a peculiar art form where music – any music – poetry and drama merge in a result that transcends its single parts to become something uniquely powerful and evocative, possibly the most soul penetrating art form to ever exist? If this is a more correct definition of opera, then the specific type of music stops becoming the defining element of opera and simply remains an element of the whole. We have to let go of Verdi and Puccini, we have to go beyond classical beauty, Doyle and Fraad seem to be saying. That said, and although this was not the place to go to admire the virtuosity of the singers, there was some beautiful singing throughout the evening. As it says on Doyle’s website, “His music is a celebration of the multiplicity of musical languages and evolving technologies.” As well as some very eclectic music, there was some remarkable and/or unusual singing. First of all, Daire Halpin: Dublin’s audiences have had recently the chance to appreciate the lovely voice and technical prowess of this soprano in Opera Theatre Company’ Don Giovanni. Then there was the simply beautiful and already well trained voice of young soprano Aimee Banks (14), who was cast for the lack of a boy soprano (playing the young Bruno). Tenor Morgan Crowley played convincingly the central character, while Catriona O’Leary as a mezzo-soprano gave a counterpoint to the majority of high range voices in the performance. Last but not least, the male soprano Robert Crowe, whose category in itself is a rarity, as countertenors and the likes were mostly used in opera up to the 18th century. This peculiarity was used to great effect throughout the opera to convey, among other feelings, that of estrangement and ambivalence in the brilliant pre-trial scene between Bruno and Cardinal Bellarmine: far from being the monodimensional villain, the Cardinal here shows his intellectually seductive side in the verbal battle with Bruno, who claims to be on the side of truth: “Do you believe the truth to be a shining star? It’s a relative concept”. From a visual point of view, the total, shiny red of his suit, his sipping from a fine glass of wine, the iconic Barcelona chair on which he’s sitting, all contribute to the seductiveness of his character. If, to the variety of voices, you add the occasional use of falsetto and the mix of operatic and early music style of singing, you may start to understand the eclecticism of the whole work. From a dramatic point of view, the highlight was probably the scene of the trial in the second act: this was as moving as any “Madama Butterfly”: it brought tears to my eyes and left the audience breathless. Musically, here we had one of the few live music moments of the whole opera: the powerful beat of the drums underlined Bruno’s condemnation to death, as well as reminding us, by staggering contrast, of the (tragic?) lack of a live score, electronic or not, for most of the performance. 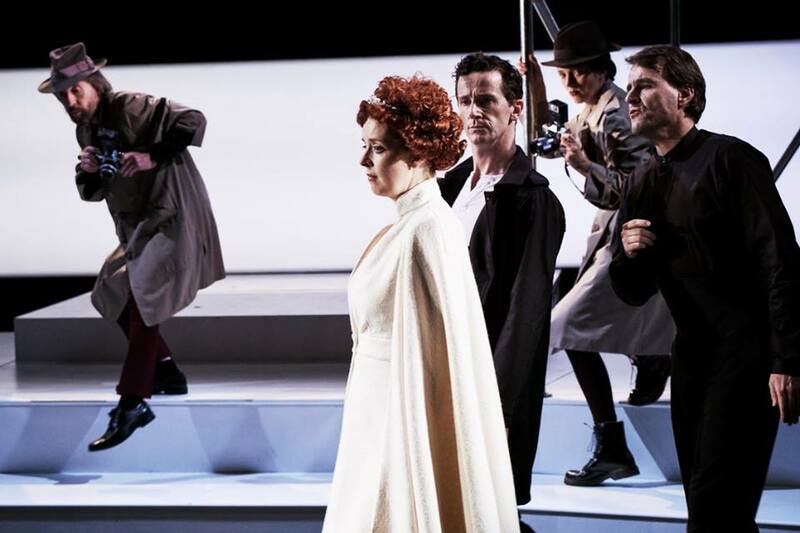 In the programmatic heterogeneity and intentional, multi-level cacophony of this work, every element of the staging worked in surprisingly perfect harmony: from the gaunt set design by Andrew Clancy to the imaginative and effective costumes by Bruno Schwengl, to the lighting design by Kevin McFadden. 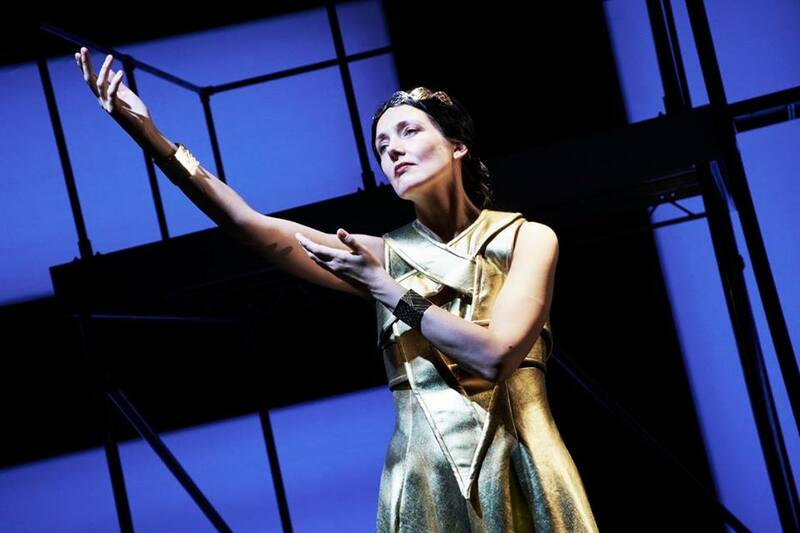 The libretto, by both Jocelyn Clarke and Eric Fraad, was spot on, both from a narrative point of view, with the original choice of episodes from Bruno’s life, and from a formal point of view, with the meaningful choice of words. A special mention goes to the wonderful direction of Eric Fraad: it must take a beautiful mind to conceive such an original, rich and poignant piece of art. Heresy is a watershed, and even if it may not make history in the opera repertoire itself, it will certainly serve as a high point in the reflection upon the very nature of opera and of art in general, as well as on what path contemporary opera may start to follow for the future. “Only with an open mind you can see”, Bruno warns King Henry III (and us) in the opera. Nothing underneath the sun is perfect, and this production may have its pitfalls, like the aforementioned lack of a live score (deliberate choice? budget constraint? ); but as far as artistic experience and expression goes, there is no doubt in my mind that this work is a five out of five. “We should brace ourselves in the intellectual heaven which is within our soul”, Bruno sings before dying.